For today's post I thought I'd do something a little different and hand my blog over to my husband Ian and let him tell you how he survives being a Dad. 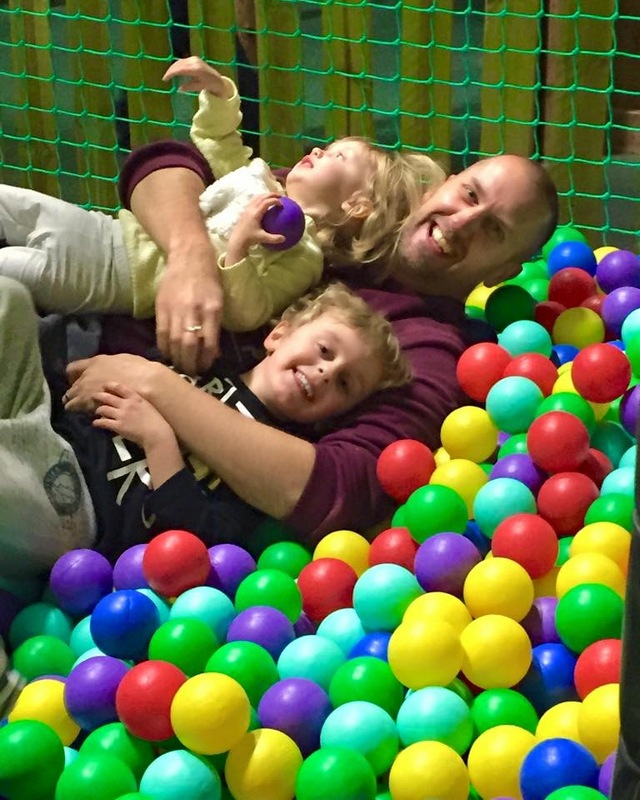 I'm Ian and I'm not really used to this blogging lark but I do know what it's like to be a Dad so here are a few tips which will hopefully be helpful. When Emma was pregnant I felt a little bit redundant because let's face it it's the women who do all the hard work and us Dad's can only really offer support so with that in mind I decided it was my role to provide her with everything she needed to be happy and comfortable throughout both pregnancies. I ran to the shop whenever she wanted chocolate (every night) I gave up my pillows so she could use them to prop up every part of her body for comfort whilst sleeping, I blew up birthing balls so she could sit for hours trying to bounce the baby out and spent what seemed like days chopping up endless amounts of pineapple in a crazy attempt to start labour when she was overdue. All of these small gestures made me feel useful and also kept Emma happy which to me was the most important part. Again as with pregnancy us Dads have a tendency to feel a bit useless during labour so I asked Emma exactly what I could do to make things easier for her and she gave me specific tasks which helped a lot. She has a strange lip balm addiction so it was my job to have a lip balm handy AT ALL TIMES, that was a very important role for me, everytime she asked for it I was straight there with the lip balm and as stupid as that sounds she said it really helped. My other tasks were to provide drinks, hugs, hands to squeeze (until my bones were broken) and also tissues as she had a cold when she gave birth to our daughter Summer. My best tip here is to ask your wife what she needs from you and just do whatever she says no questions asked. The lack of sleep can be hard, neither me or Emma cope well with no sleep so if we do have a particularly bad night with the kids, which to be honest doesn't happen very often we try and get through the next day by working like a tag team and take it in turns to deal with the kids while the other one gets a break and then swap over, I find that works better than both trying to battle on with kids while you're exhausted and then ending up bickering with each other because we're tired. So they're my top tips to survive being a Dad, I really hope they were helpful and I hope you enjoyed reading them. Remember being a Dad is a learning curve, nobody is perfect and you're going to make mistakes but as long as you're trying your best and your kids and wife are happy then that's all you can do. For all things baby related check out the new M&S baby hub where you'll find everything from clothing to feeding essentials and toys.